People come to Bayeux to see the famous Tapestry, and they discover a charming Norman town. The first reason to come to Bayeux is to see the famous Bayeux Tapestry, a 70 meter (230 feet) long embroidery from the 11th century. The Tapestry depicts the Norman Conquest and the victory of William the Conqueror at the Battle of Hastings in 1066. The Tapestry is an amazing work of art and deserves thoughtful visit. The Bayeux Tapestry Museum is right in the center of town. A short walk away is the beautiful Cathédrale Notre-Dame be Bayeux. The site is believed to date to Roman times, and the original church was built in 1077. 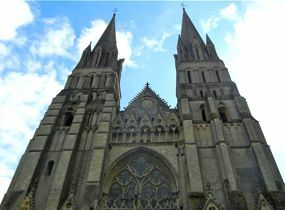 Bayeux also has the distinction of having been the first city liberated on June 7, 1944, following the D-Day invasion. The town hosts the Musée de la Bataille de Normandie, which provides exhibits and films about the famous battle. Beyond the museums and churches, Bayeux is a lovely historic town, with a number of lovely half-timbered houses, cobblestone streets, and charming gardens. Wandering through Old Bayeux is a great way to get a feel for Normandy. Above, Scene from the Bayeux Tapestry. Below, Cathédrale Notre-Dame de Bayeux.